Sony releases new NSZ-GS8 Google TV box | What Hi-Fi? 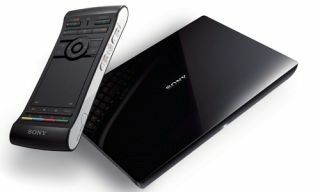 Sony has announced the release of its new Google TV set-top box, the NSZ-GS8. The latest model will replace the NSZ-GS7 released last year. The new Sony Google TV box has an early July release date and looks set to have a slightly cheaper price than last year's model, selling for around £130. The NSZ-GS8 set-top box allows users to search live TV, the internet and apps, and the addition of a microphone to this new model will allow you to use voice search to find your favourite videos or webpages. There's also a fancy remote control (below) with full QWERTY keyboard. The Sony GS8 will also allow you to customise the internet player with thousands of apps – ranging from news to movies to sport, making sure everyone in the family has something to watch. What's more, the introduction of Sony's Airtight app means you can share photos and videos from smartphones and tablets to their TV, too. Last year's GS7 didn't exactly bring Google TV to the masses but it seems Sony, along with the likes of LG, are happy to keep a finger in the Google TV pie. We'll look to bring you a review of the Sony NSZ-GS8 Google TV box just as soon as can get our hands on one.